A WOMAN told me recently that if she hears one more bad poem about water charges, she may take the extreme retaliatory action of paying her water charges bill, in the unlikely event that it ever actually arrives. Protest poetry is in fashion right now; its chosen method of delivery usually the internet. Most of it is terrible in a naïve, almost forgivable way. The essential ingredient the clunking rhyme; “nation” and “detestation”, “water” and “slaughter”. However the worst thing about it is that those who write it, generally speaking, appear to have no understanding of the political and economic establishment they think they are against. 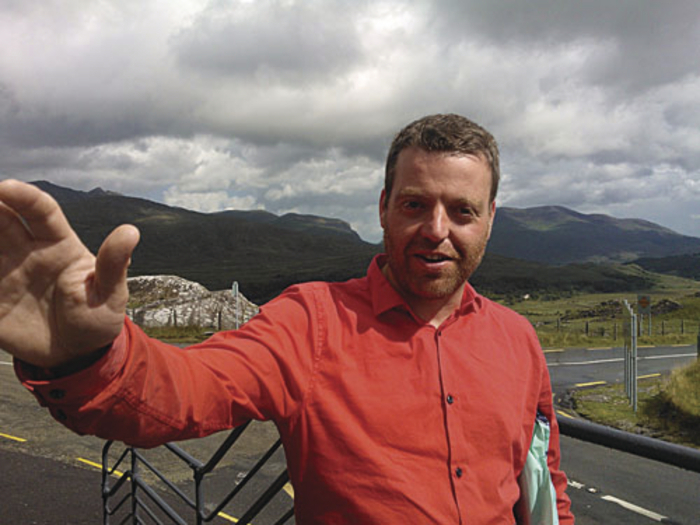 Dave Lordan (pictured above ) is perhaps Ireland’s leading protest poet. Unlike the pretenders, though, Lordan has an intimate knowledge of what he is against and from that comes the outline of the better world his latest collection of poems, Lost Tribe of the Wicklow Mountains points the reader towards. ‘Workmate’ is about a female office worker who spends most of the day playing Farmville and poking friends on Facebook. When a shiny sounding DJ on the radio asks “whether it is right to cut the benefits/of those who refuse a reasonable/offer of employment?” she responds with an almost orgasmic, multiple “Yes”. The defining thing about this book though – Lordan’s third - is that it represents a sharp turn away from anger, towards a very particular kind of hope. ‘Love commands the neighbourhood’ is a startling poem about all those Lordan thinks we should love, but do not: “Teenage thief who nicked your MacBook/in the park and in the café your keys/and will die sometime tomorrow afternoon…” This poem urges us to empathise with those broken by things as we’re told they have to be, and its implications are revolutionary, because implicit within it is the idea that an entirely different type of society is possible, if only we would let ourselves imagine it. Elsewhere Lordan takes the risk of titling a poem ‘Hope’: “Hope, ya ould mutt I hear yer in bits./I heard somebody stomped on yer throat an’ all ya can do now is grunt.” As the poem goes on, he urges the aforementioned hope to get up because “I ain’t ready tuh let ya/go jus’ yet”. Lordan is also a poet capable of moments of profound lyrical beauty and his 20 page elegy for Denis Boothman ‘Notes for a Player’ is full of such moments, starting with the fantastic first line: “Towards the end you had hair made of moonlight”. ‘Fertility Poem’ is a comedic, but also emotionally charged, poem in which the poet’s six-year-old daughter points “at graffiti/on the slats around the back of Superquinn”. Someone has written the C word “in dripping lipstick red”. She asks what it says: “It says COUNT sweetie, COUNT.” And then the six-year-old proceeds to spell the word out phonetically, as she’s been taught to at school: “Kuh-Uh-Enn-Tuh COUNT”. Dave Lordan could make poetry of anything; he is one the few of his generation who deserves to be called great.